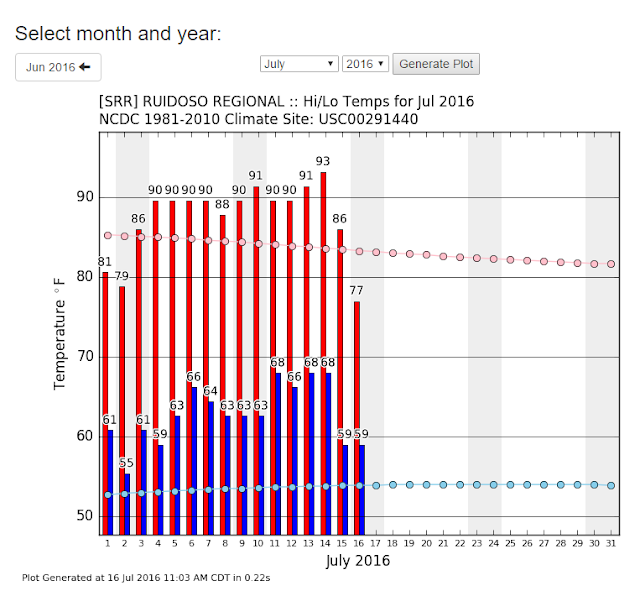 First Half Of July 2016 Has Been Hot In Southeastern New Mexico. First 15 Days Of July Above Normal For Most Of NM. (Departure From Normal In Degrees-C). Second Highest Temperature Recorded At Our Home In Carlsbad, NM (2006-2016). 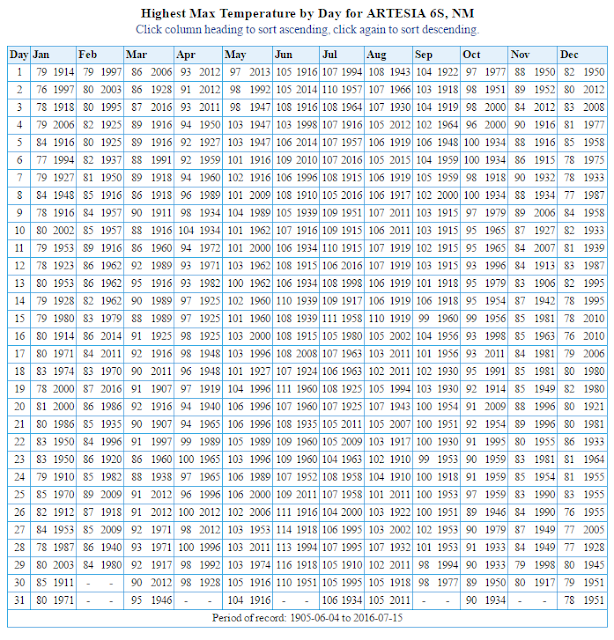 The Highest Was 112ºF On June 26, 2011. 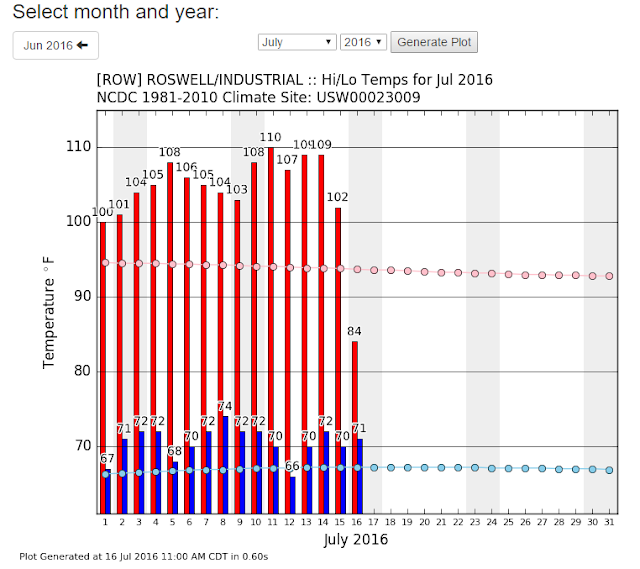 My High Temp On The 14th Was 111ºF. Making This The Highest Temp Of The Year So Far. Daily Temps Recorded At Our Home In Carlsbad, NM. 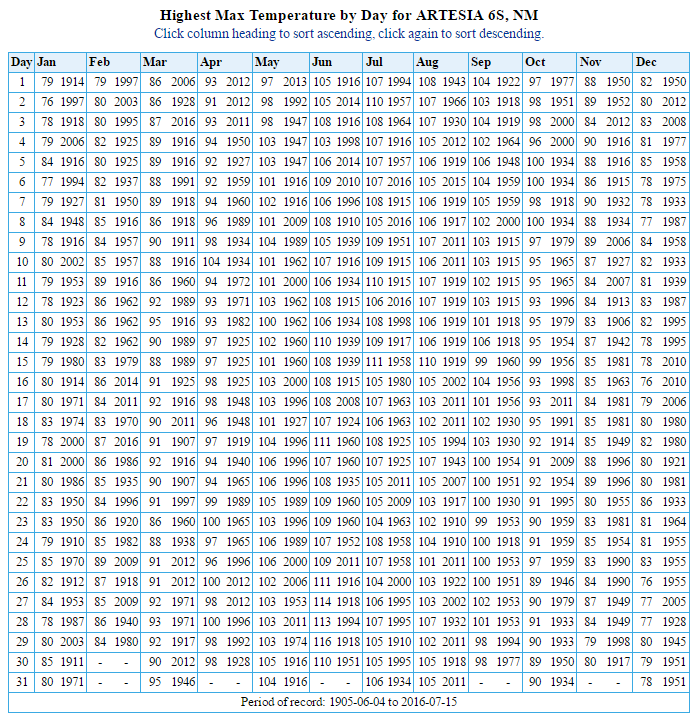 I have recorded a total of 23 days so far this summer with daily high temperatures at or above 100ºF. 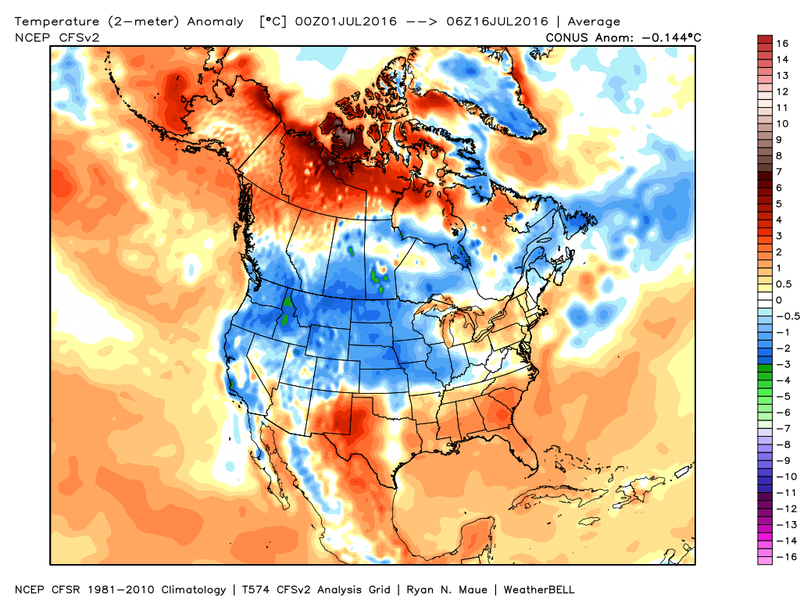 As of yesterday (Friday) I had recorded 13 days in a row with highs at or above 100ºF. 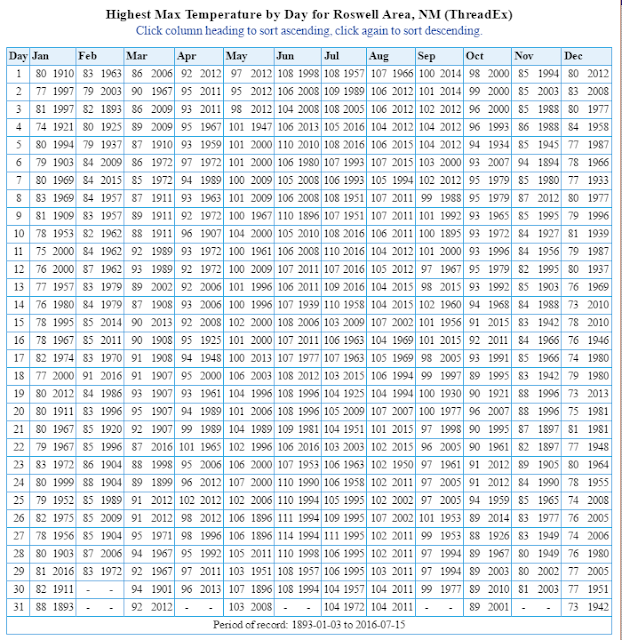 The average daily high temp for the first 15 days of the month was 105ºF. My low temperature here at our home on the 8th was only 79ºF. This is the warmest low temperature that I have recorded here at our home in the past 10 years. 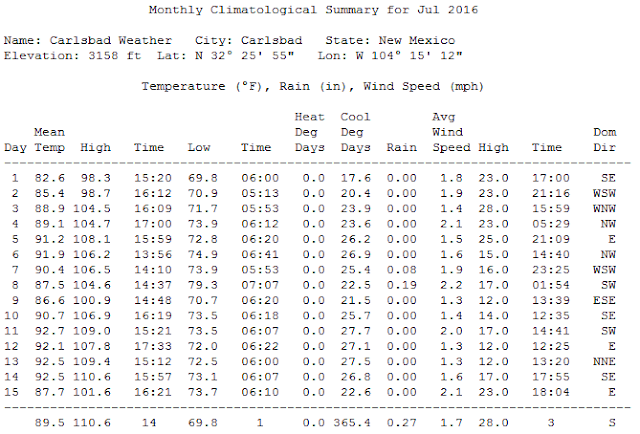 First 15-Days Of July 2016 Were Hot In SE NM. 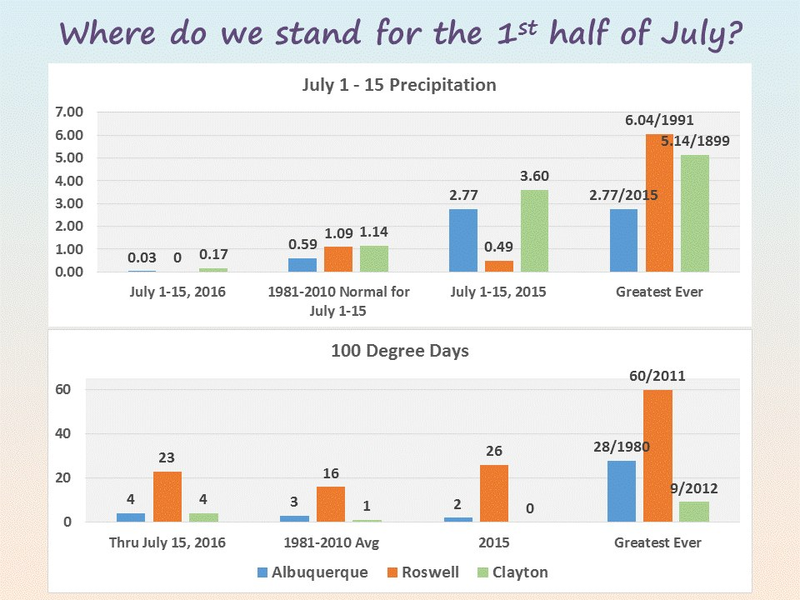 Courtesy Of The Albuquerque NWS Office FaceBook Page. Roswell has recorded a total of 23 days so far this summer with daily high temperatures at or above 100ºF. 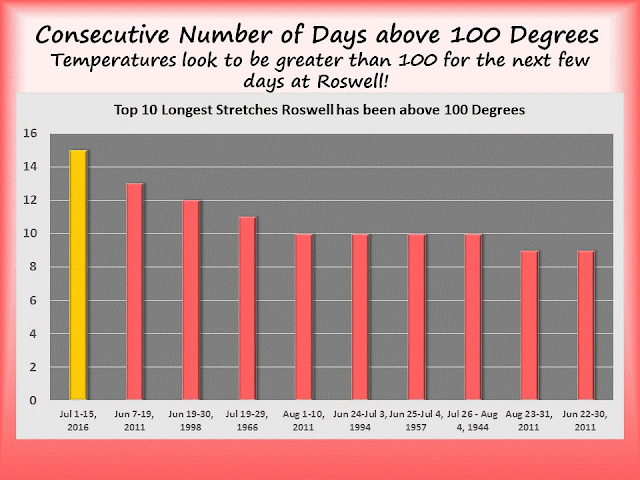 As of yesterday (Friday) the Roswell Airport had recorded 15 days in a row with highs at or above 100ºF. 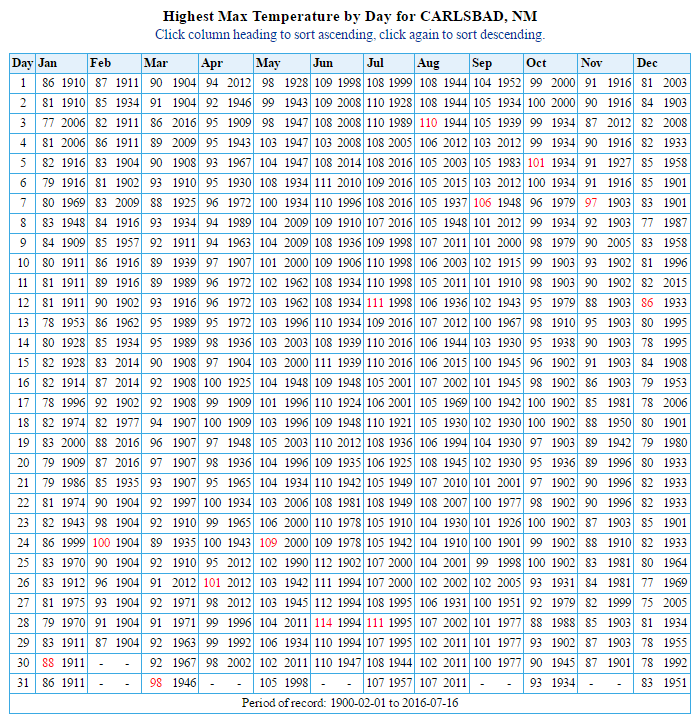 The average daily high temp for the first 15 days of the month was 105ºF. Their highest temp was recorded on the 11th with 110ºF. 10 Times In History Its Been 110ºF Or Hotter In Roswell. 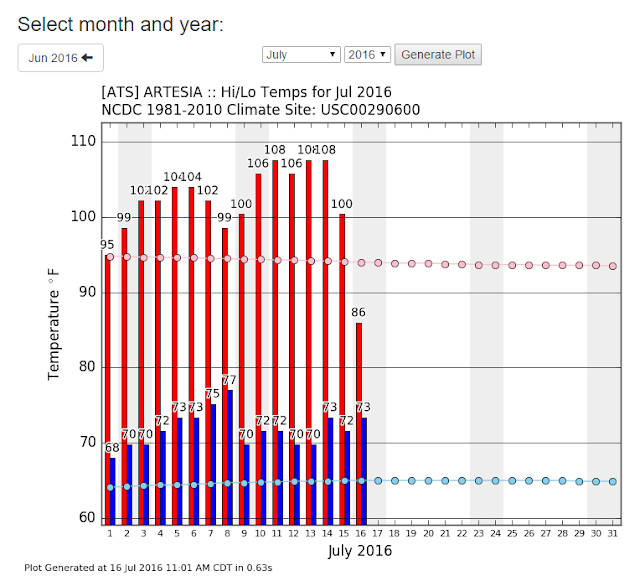 The Artesia Climate Co-Op Climate Station located 6 miles south of town at the New Mexico State AG Research Station recorded a high temp of 109ºF on the 11th. They have recorded a high temp of 100ºF on 23 days so for this summer. 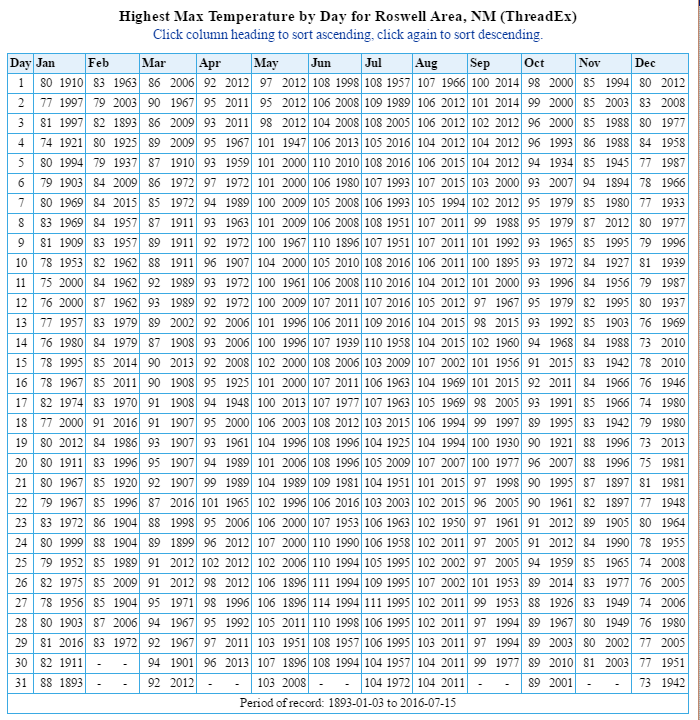 The average daily high temp for the first 15 days of the month was 104ºF. 11 Times Its Been 110ºF Or Hotter At The Artesia Climate Co-Op Station. 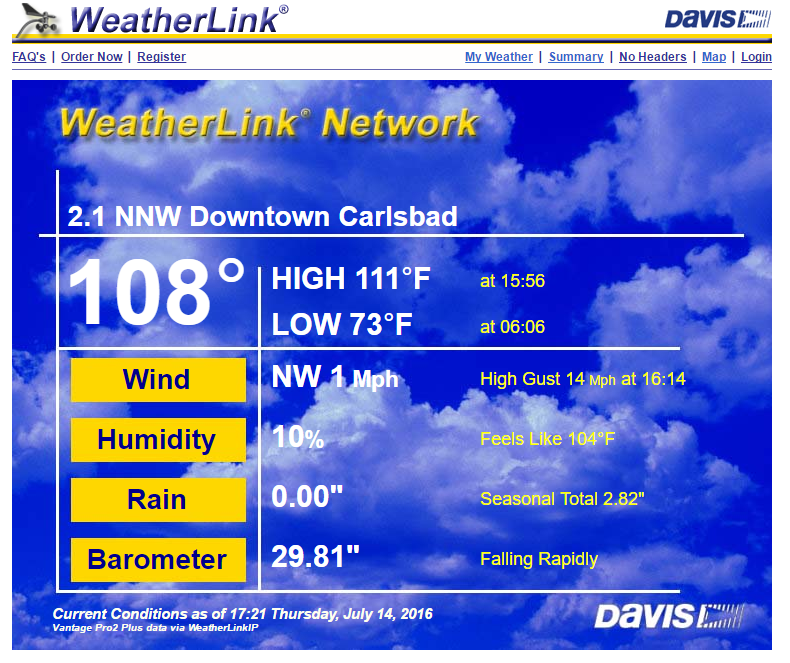 The Carlsbad Airport has recorded 23 days so far this summer with a high temp of 100ºF or higher. The Airport recorded a high of 110ºF on the 11th and 14th. The average daily high temp for the first 15 days of the month was 105ºF. 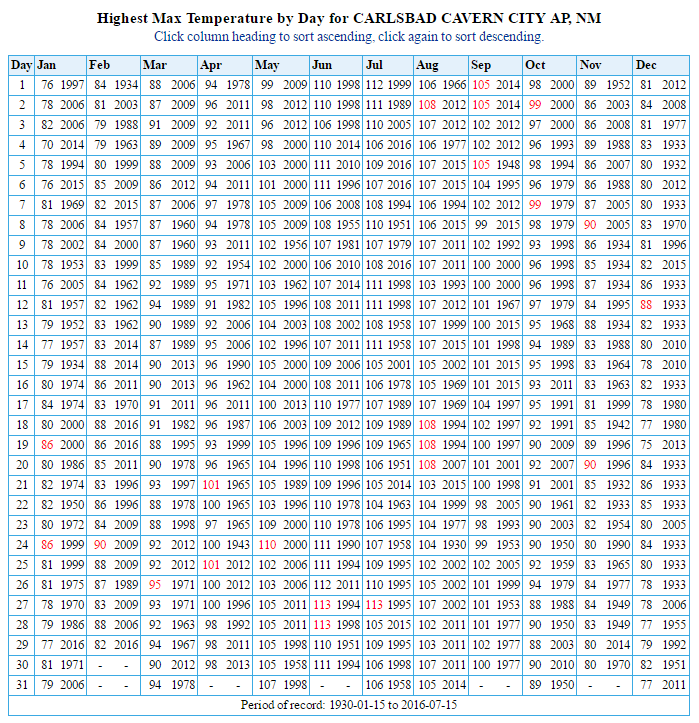 Comparing this summer so far with the brutal summer of 2011 we find that the Carlsbad Airport recorded 76 days that year that the temperature reached or exceeded 100ºF. May had 4 days, June 26 days, July 20 days, August 25 days, and September 1 day. 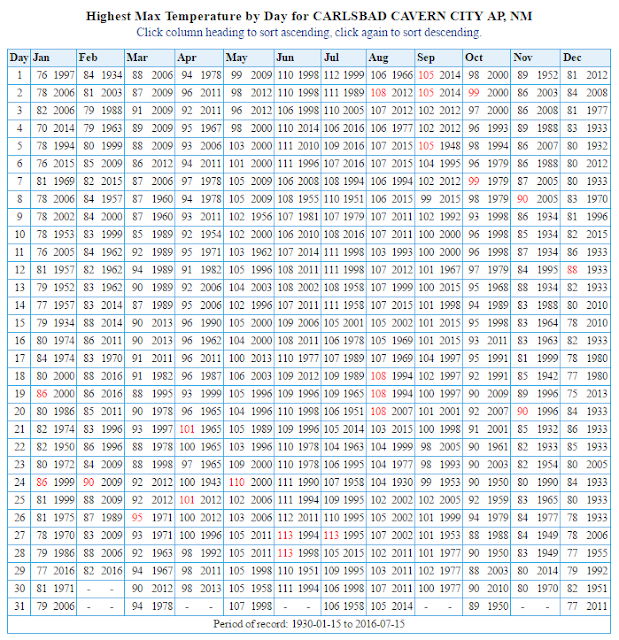 The highest temp that year recorded at the Carlsbad Airport was 112ºF on June 26th. 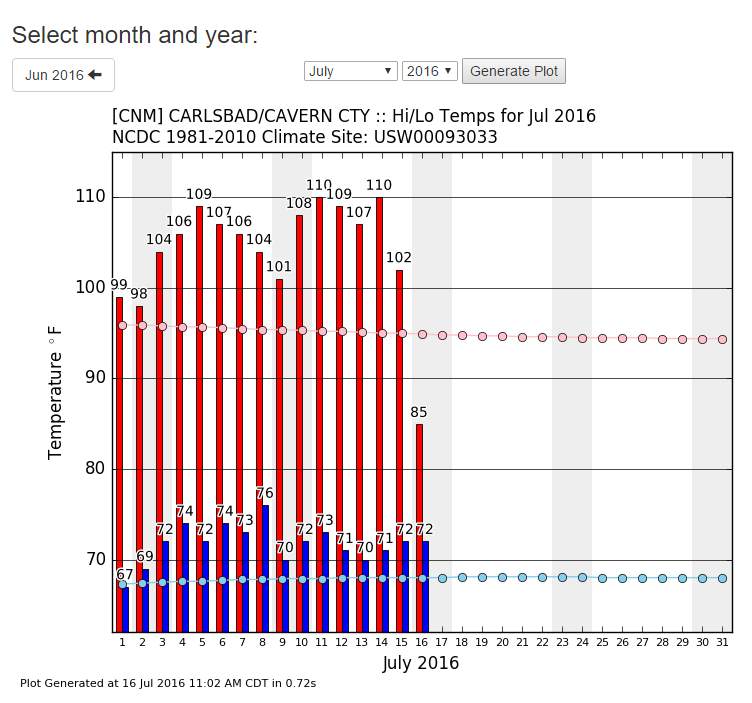 25 Times Its Been 110ºF Or Hotter At The Carlsbad Airport. 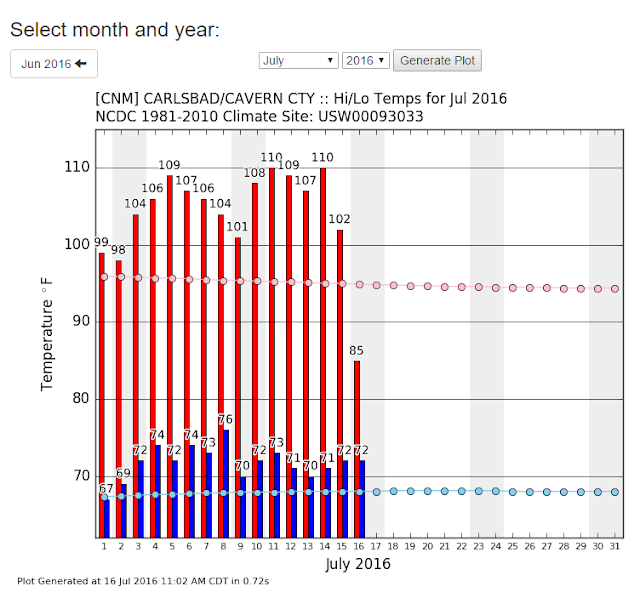 24 Times Its Been 110ºF Or Hotter At The Carlsbad Climate Co-Op Station. Sierra Blanca Regional Airport Temps. 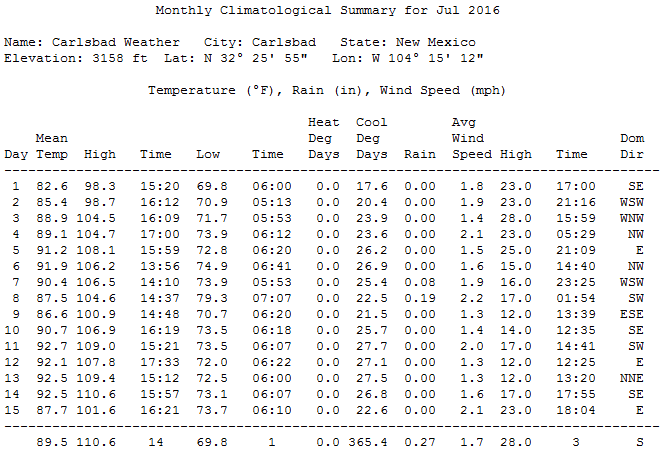 The Sierra Blanca Regional Airport (Elevation 6,851' MSL) has recorded a high temp of 90ºF 10-days this month so far. The highest was 93ºF on the 14th.